I am so happy to be fostering Casey L. Bond this week! Casey writes under two pen names across several genres! See her note below! Hey everyone! If you don’t know me, I’m Casey Bond. I write young adult, paranormal, and fantasy under the name Casey L. Bond and adult contemporary romance under C.L. Bond. 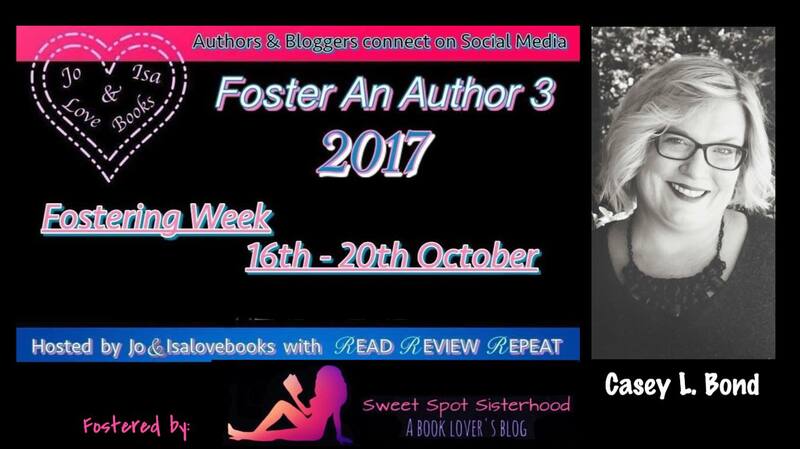 A huge thanks to Jo&isalovebooks Headtalker & Thunderclap Support for organizing the Foster an Author event for 2017 and to the ladies at the Sweet Spot Sisterhood for fostering me! I’m from West Virginia, a Marshall University alum, wife, mom and lucky enough to do what I love, which is write books and share my stories with readers all over the world. If you’d like to check out my books on my Amazon page, at the end of the week, one lucky reader will be chosen to receive a paperback copy of one of my books. of age or older to enter.